Morgan James Publishing, 9781630471989, 188pp. 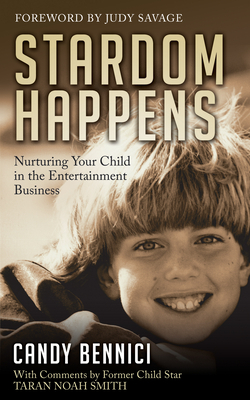 Stardom Happens is a guide for parents and their children to navigating the intricacies of the entertainment business. It helps parents get their child into the business with information about agents, resumes, auditions, etc. The book also covers the expectations placed on a working child actor and helps families stay positive and avoid problems so that everyone emerges with a good experience. Candy Bennici has been a manager of two children in the entertainment business for a total of eighteen years. Her daughter, Aria Smith, was an international model and her son, Taran Noah Smith, played "Mark," the youngest son on the hit show Home Improvement, for the eight-year run of the show. Since the show ended, in addition to being a script supervisor for feature films and an elementary school teacher, Candy has devoted time to helping parents keep their child happy and safe while acting. She has been on several talk shows including The Donny and Marie Show, Jim Jay and Ann, Christina, and The Carol and Marilyn Show. Candy grew up in West Los Angeles and moved to the San Francisco Bay Area in 1968. Now, when she is not writing, she loves being "Grami" to her two wonderful grandsons. She currently lives on a sailboat in San Rafael, California, with her husband, David, and her dog Sprite.